My latest trip to Hanoi had been a fantastic experience. Probably because it was my first time in Vietnam. There were so many new things to discover & learn about as well as new eating places to explore and new & unfamiliar food to try. Vietnamese food has always been one of my favourite cuisines and this Hanoi eat-venture had really given me a completely new level of understanding/appreciating what the essence of the Vietnamese food culture was about. Truly inspiring. I have so many ideas running in my head now, that I’m going to try recreating these dishes in my kitchen and I will of course share the recipes with all of you later on. 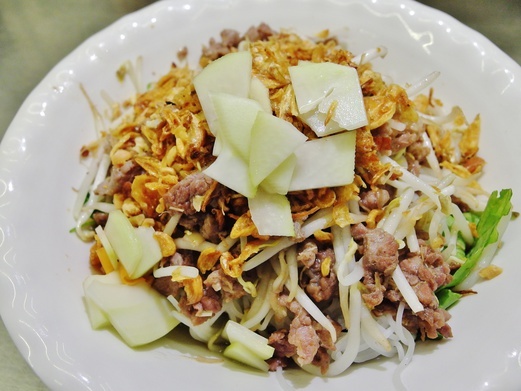 A humble-looking bowl of beef vermicelli salad which was one of the best dishes I had in Hanoi. The winning factor was the perfect balance of flavours in that delicious nuoc cham dressing (fish sauce based). Not forgetting a generous amount of beef too. 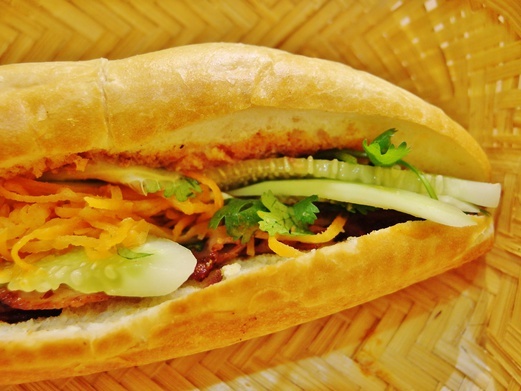 No visit to Vietnam is complete without having a banh mi, a fusion baguette sandwich that originated since the French colonialism days. You can enjoy the banh mi anytime because it’s so readily available and the best part is, it is very cheap & good. This ultra smooth porridge that was cooked in a pork rib & cartilage broth and topped with crispy, chunky fried dough fritters and moreish pork floss was simply spectacular. It was so delicious & comforting. Definitely the best porridge I ever had. 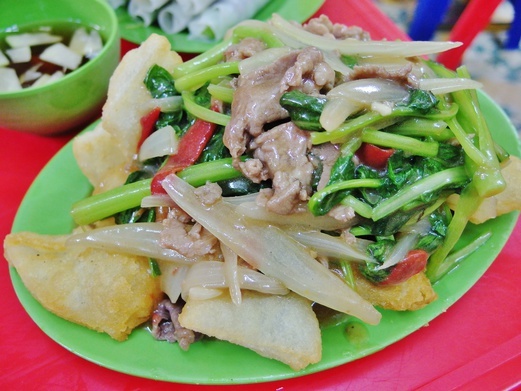 This dish really brought pho noodles to a whole new level as we could enjoy them in the form of fried ‘pillow cakes’ that came with sliced beef & vegetables in a savoury sauce. Incredibly tasty. Truly mind blowing. 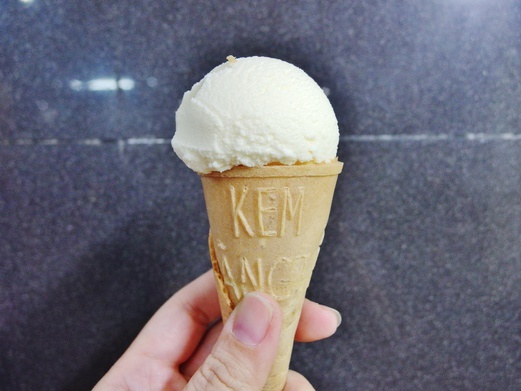 Looked like the regular scooped ice cream on cone but the recipe here was somewhat different. Texture was more icy and it wasn’t very sweet or cloying. The cone reminded me of the egg rolls we’d eat during CNY. No wonder the locals love this so much. Initially I thought the bun cha from Bun Cha Huong Lien might be overrated with all that media hype last year but after trying it myself, I must say it was absolutely legit (BEST one I had in Hanoi). Now I know why Anthony Bourdain had brought Barack Obama here. 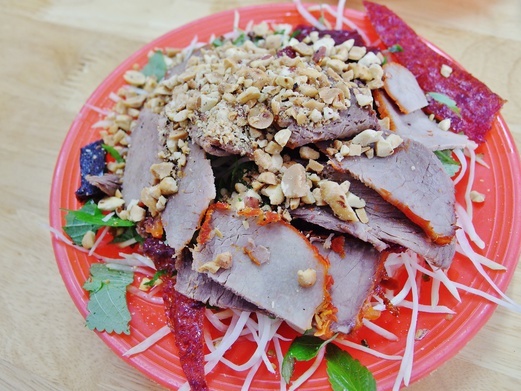 Nom Thit Bo Kho or ‘dried beef salad’ consists of green papaya, assorted herbs (mint leaves, coriander, etc), sliced beef, dried beef and chopped roasted peanuts in a fish sauce dressing. It’s the perfect salad for the carnivorous. 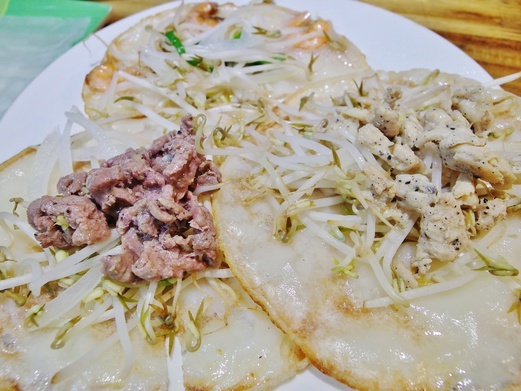 The banh xeo or rice flour pancakes come with different savoury fillings that include chicken, beef or shrimps. They can be rolled or wrapped up in rice paper wraps and then eaten like spring rolls dipped in fish sauce. Great combination of textures & flavours. The original creator of egg coffee had brought coffee drinking to a whole new level. 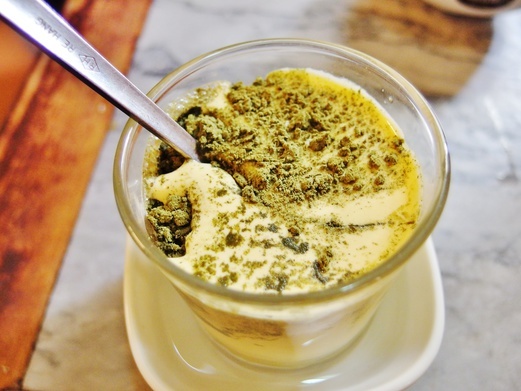 This is more than just coffee, or rather, it is a dessert in a cup that tasted similar to a tiramisu. Rich, creamy and delicious. A must try. 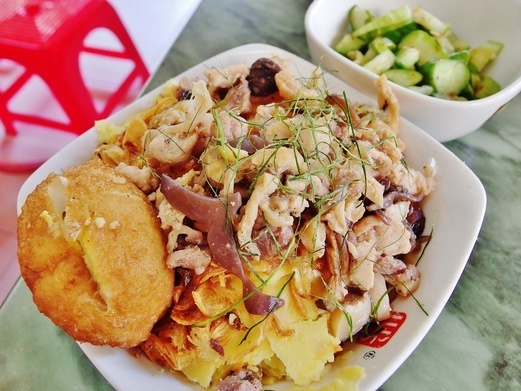 Xoi is a glutinous rice dish that comes with various toppings of your choice. It’s a unique breakfast dish and also a very scrumptious one which kinda reminds me of a deconstructed bak chang. 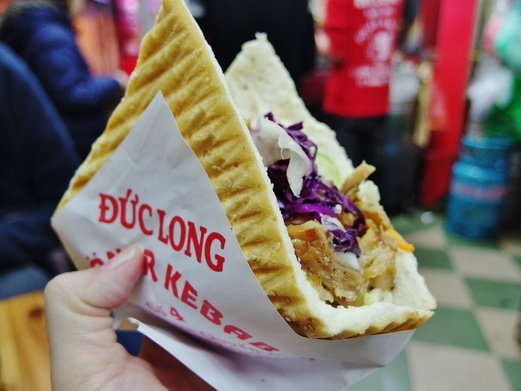 The banh mi may be the epitome of Vietnamese street food but this unrivalled Doner Kebab from Banh My Duc Long Doner Kebab is just as divine. Massive portions at very affordable prices. There’s no reason not to like. 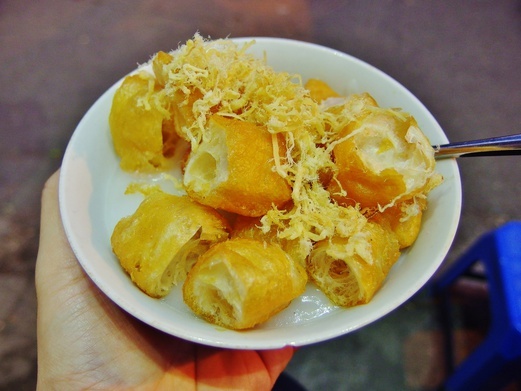 A different version of banh cuon that originated from Phu Ly, the capital city of Ha Nam province in northern Vietnam. 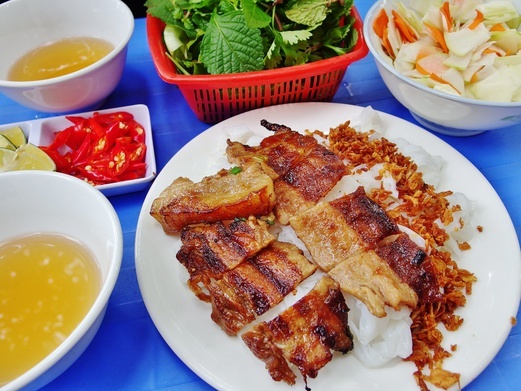 Instead of being rolled up, this was more like dry rice noodles paired with grilled pork and fried shallots. Simply delish. 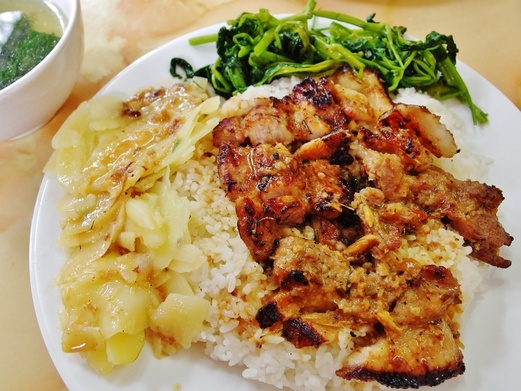 Com Suon Nuong is Vietnamese pork chop rice. The smoky flavour of the grilled pork was just incredible. A savoury sauce was doused over the rice so this entire plate was packed full of flavour. 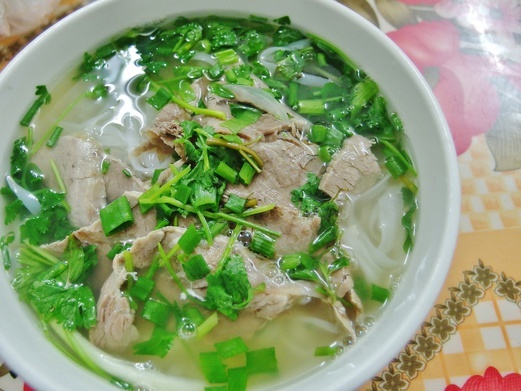 Many would not disagree if we are to say pho is the national food of Vietnam. 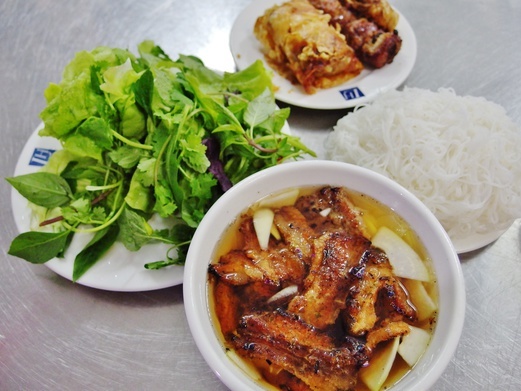 You can find pho almost on every street in Hanoi. Light, flavoursome broth with tender beef slices. A very comforting meal to have anytime. Bia Hoi is a type of draft beer that has no added preservatives. It is freshly brewed on a daily basis and then delivered to beer joints every day. 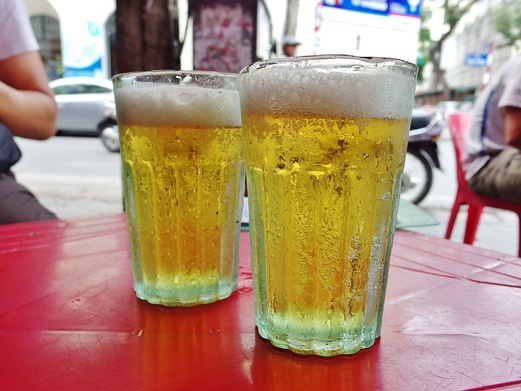 Price of bia hoi can start from as low as 5,000VND (SGD0.30) per glass – super cheap. I’ve never eaten so much dill in my whole life! 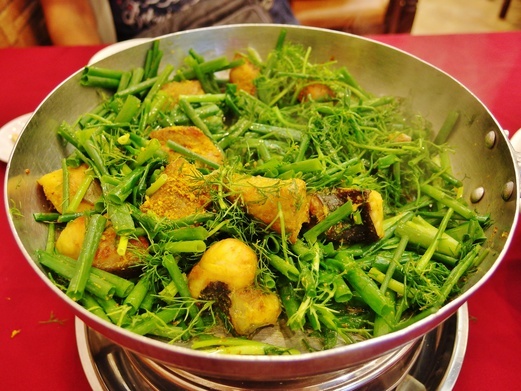 The combination of herbs with turmeric-flavoured fish is not just unique but delicious too. 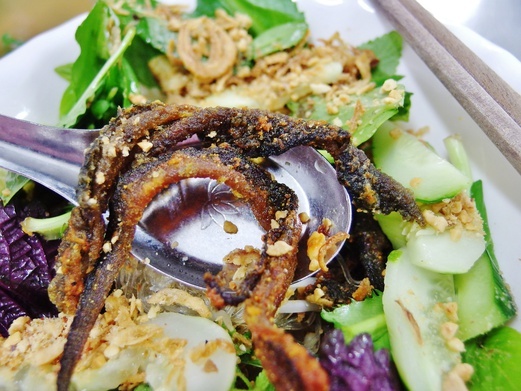 This dish is a must try when you’re in Hanoi – it’s so good, a street is actually named after it. 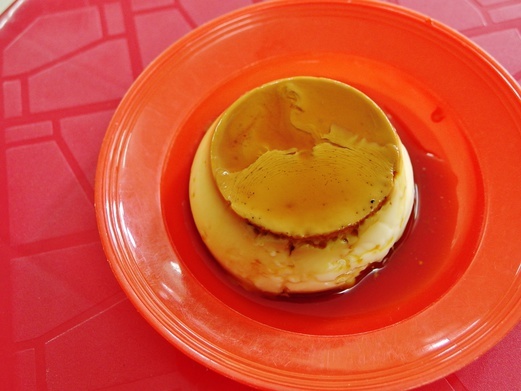 Kem Caramen (or better known as crème caramel) has always been a very popular dessert in Vietnam because of French influences in the past. We tried and simply fell in love with that nice eggy pudding with a perfectly balanced caramel. Never been a big fan of eel but the stir-fried glass noodles with crispy fried eel at Mien Luon Dong Thinh was pretty good especially with a good squeeze of lime. It was like a Vietnamese version of Sin Chew Bee Hoon. S’Patisserie, located near the southern end of Hoan Kiem Lake in the Old Quarter, serves up delicious cakes coupled with great atmosphere and impeccable service. 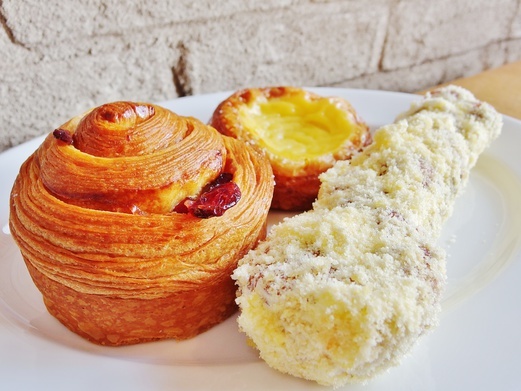 Also, check out South Korean bakery, Tous Les Jours at Vincom Mega Mall Royal City – their Asian-French pastries and breads are delicious beyond words. Yenyen Bakery is a humble shop in Ba Dinh district that sells tasty French style breads and pastries at reasonable prices. 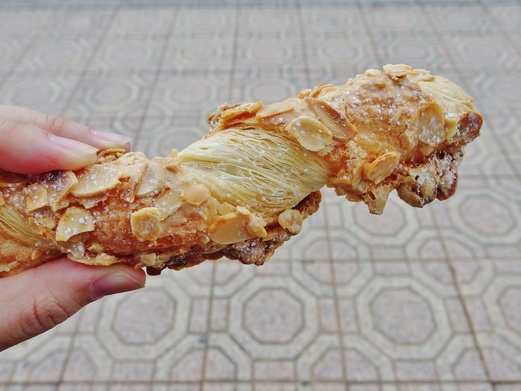 The Almond Twist (pictured) is a must try! 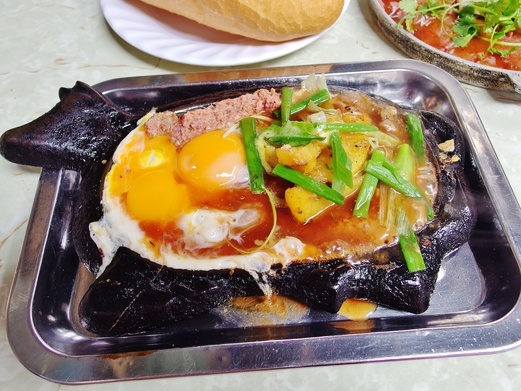 Also, check out King Roti at 34 Hang Gai, that specialises in Mexican Coffee Buns – rich, salty and fragrant! 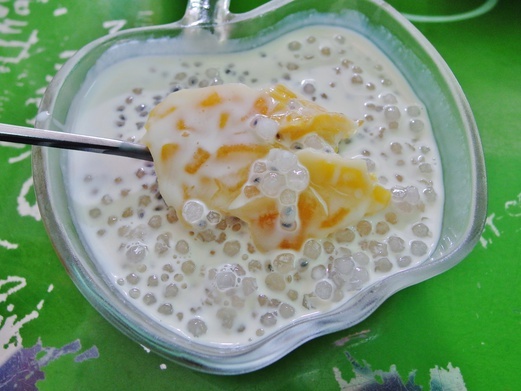 The Che Xoai (mango dessert soup) and Thach Rau Cau Dua (coconut jelly) from Minci were pretty amazing. Need a dessert to end your day on a sweet note? You can’t miss this dessert house that also offers a wide selection of other sweet treats. 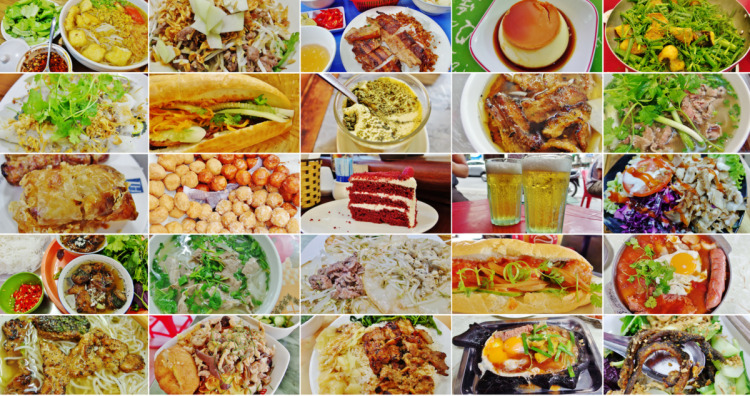 The Bit Tet is a unique example of Vietnamese-style Western food i.e. steak. It is served with fresh baguette so you can use it to mop up all that delicious gravy and runny egg yolks. 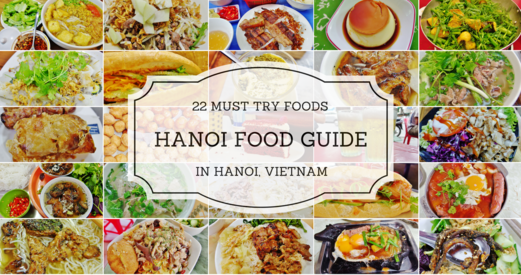 Worth a try if you’re looking for something beyond the regular Vietnamese fare. These look great, my boyfriend and I arrived in Hanoi today so will definitely check a few of these out – thanks!